Karis May Darling was just 12 when she died after contracting streptococcal A (An invasive infection which caused Karis to develop meningitis). Karis’ parents made the decision to donate her organs which gave the gift of life to five people. Dad John said: "Karis always wanted to help people. To know that she has stopped five other families from this pain, we are so proud of her and we know she would be to." "We knew that we could not have changed what happened to our little girl, but we did have the chance to stop this pain from happening to five other families." 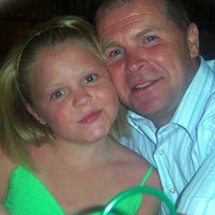 Sadly, Karis’s illness had caused to her brain to swell, leading to irreversible brain damage. After numerous tests, Karis’s family were told that she was no longer able to breath for herself. Karis’s mum explained “It truly was the most difficult day of our lives. However, when the specialist organ donation nurses came in, they didn’t even get a chance to say who they were, or asked us the question. We just instinctively knew and we told them that Karis would have given her last penny to anyone in need and I knew Karis would want to help others by donating her organs”. “Organ donation is just not a subject that you think about telling your children. But it has raised awareness for us and our community. We often think of the families that Karis saved during difficult times of year." "We get comfort from knowing those families are able to enjoy birthdays and Christmases together. All because of her, because of my beautiful little girl’s gift."